A BEM reader emailed me about this figure asking if I knew what it was. Sadly, I’ve no idea so I’m posting here to see if any of you can identify it. Everything but the shorts are metal, no markings. Previous PostCreature FeaturesNext PostSite feedback? Tweeted it out. Hopefully you’ll get some replies. I have one, too, minus the legs. I’d love to know what it is! It almost looks like a cross between He-Man and a Metal Man. There aren’t a lot of toys (that aren’t knock-offs) that so completely stump me as this one. The total lack of markings makes me think it must be part of a larger toy, or maybe South American. I lived down there for a while and a lot of the Mexican, Brazilian and Argentinian toys came without any sort of mark. Thanks to the “Action Figure Identification” group on Facebook for pointing me in the right direction. His name is “Demon Man” and he was found in two different KO lines. One (obscure) called “Galaxy Warriors” was released by Woolworth’s in 1987. This is confusing because another, completely different He-Man knock-off line called “Galaxy Warriors” was released by Sungold earlier in the ’80’s. After Woolworth’s version hit the shelves, Sungold had to rebrand their line to “Freedom Fighters” because they forgot to trademark the name “Galaxy Warriors”, which Woolworth’s later did! Upon researching this, I had *no idea* that there were so many He-man KO lines. Or that there are folks out there who are *PASSIONATE* about He-Man KO’s! I don’t think this guy even has Demon Man, and that’s saying something! Lastly, I still CANNOT find a photo of a *carded* Demon Man! Wow! Talk about obscure. . .
Clarificaiton – I cannot find a photo of a carded Woolworth’s “Galaxy Warriors” Demon Man. 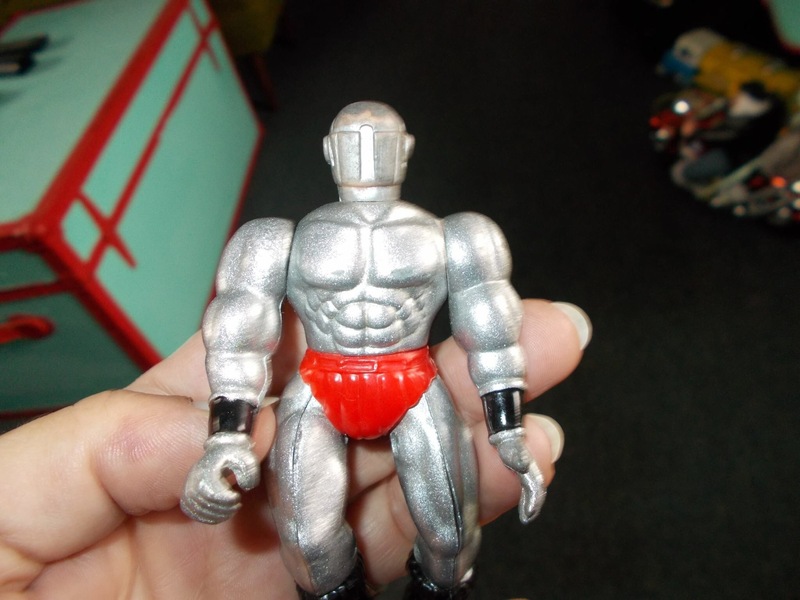 I found the more obscure, carded “Power Fighters” Demon Man in that last auction link. Wow. That is some serious toy scholarship. Color me very very impressed. And I’m pleasantly surprised that my instinct about it being a He-Man KO proved correct. Hi I’m the lady with the Demon Man toy…I thank you all very kindly for the wonderful help…you peeps rock!!! I’m impressed with the information and willingness to help! Thank you all so very much!! Anyone interested in buying him?